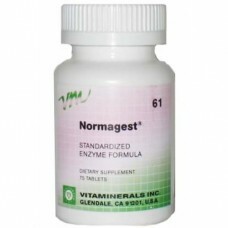 Vitamineral's Normagest is a unique formula used to help increase digestion capabilities. This formula includes four enzymes that target starch, protein, fat, and vegetable cellulose digestion. It is also coated to protect the enzymes from the high pH acidity of the stomach. Sources of activity are pancreatin, ox bile salts and primary cultured enzymes.